Episode 94: Outside the Library! 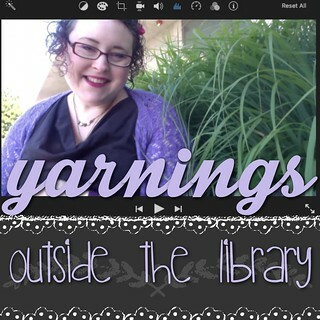 Welcome to the Yarnings Podcast, episode 94. Recorded Tuesday, August 23, 2016. It's clear skies and 59° in Vancouver, WA this morning. Join me from my outside space at the library with some stories. The story of a long hibernating pair of socks that were finished with #stashdash is spotlighted. Lifestories: sprained ankle still recovering. anniversary drive up the gorge let me intro E to Hamilton. Stashdash 2016 totals: 7335 yards knit + 1196 yards spun = 8531 total yardage, which is 7800 meters! 3 tops, 3 shawls, 3 pairs of socks + 2 braids of fiber spun. FO: Island Vote Socking from 2012 #sockthevote knitalong with the SingleHanded Knit podcast. WIP: 2 red witches socks in 716knits yarn "bored now" colorway. PALKAL for the bag. new WIP: considering what to make with gifted handspun from Rebecca of Blue Bonnet Fiber. Might go with my leftover WooBu. PalKAL! Yarnings: Spinning a Tale: Tour de Fleece ended 7/24 #teamsasqatch. WIP: Santa Creek Creations polwarth gemtones - 12oz purchased at the Columbia Gorge Fiber Festival last November. Knitalong/Craftalong! Yarnings Summer School. Take a class, in person or online like Craftsy (affiliate link) and craft along with the class if possible. In the thread, share a summary of what you learned and a picture of your crafting or knitting while learning to be eligible for a prize or two. We have a pattern sponsor and some yarn. I attempted to watch Piece by Piece: Quilt-As-You-Go Techniques (affiliate link), but I had a hard time connecting with the hostess. I knit on my Summer Vines while I watched. Also read Short Row Knits by Carol Feller. KAL for Superpowers Shawl. The thread is now opened! There's a coupon code in the episode. My patterns are part of the PALKAL for the Actually Knitting podcast (through September 15th). Dice City. Isle of Skye and Islebound at Guardian Game day. Manhattan Project: Chain Reaction. Xenon Profiteer with Leah as part of #auntkristinesknittingschool. Pokemon Go! Sagas of Geekery: Now Watching:The 4400 rewatch with E, on s04. finished Stranger Things. Gilmore Girls and The West Wing on my own. Fanciful Chatter: LuLaRoe heart skirt (my first Madison, it has pockets! from my friend Dacia's group) paired with my Hitofude. new Chloe + Isabel Geovista jewelry (from my friend Denise's site). Colourpop lips and eyes in pink. Book of Cooking: salads with fun fruit toppings. my Instant Pot's name is Yuna (of Final Fantasy X and X-2) - made several recipes in Yuna recently: Butternut Squash Risotto and a Spicy Raisin Steel Cut Oats (started with this recipe and changed up the flavors). Happiness Continues: loving my library (Fort Vancouver Regional Library: Vancouver branch). Lavender at the hospital.